This entry was posted on 20 August, 2007 at 9:33 pm and is filed under Around Town, Let's Get Visual. You can follow any responses to this entry through the RSS 2.0 feed. You can leave a response, or trackback from your own site. Such a shame. Such a shame someone is deprived of their youth, their adulthood, their later years. Such a shame this just keeps happening. Rest in peace “Beautiful Black Pearl” I know you’re just fine and in the arms of our maker God the Father. Rest well Ebony “The Lovely One” with the beautiful smile, and the eyes that danced…you will be missed, but we shall all meet again. Rest in peace “Sweet Angel”. My last name is Huel as well. My husbands family is From Louisiana. any relation? 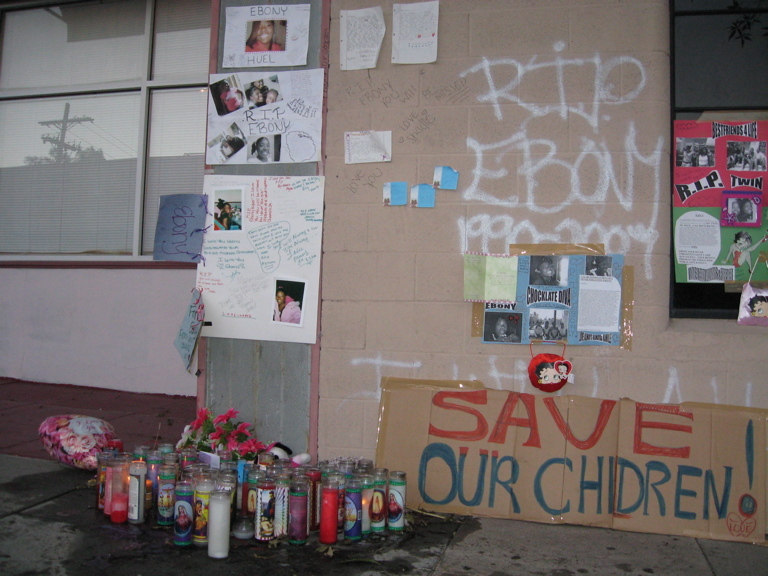 Hey like to say RIP to my cousin Ebony… our whole family miss you..
rip ebony i stay missing you.. The above comment is advertising spam. DAMN CUZZO U R TRULLY MISSED BUT I KNOW YOUR N A BETTA PLACE SO I KEEP ON MOVIN KNOWIN THAT YOUR WHERE YOU SHOULD BE…..I LOVE AND MISS YOU…..